These striking black and white birds, with tails as long as their bodies, shimmering blue in the sunlight, are often seen around the site. Singly, in pairs, or in gangs, they make their presence felt, as, particularly at this time of year, they can be seen mobbing smaller songbirds. During the summer they mainly eat caterpillars, spiders, worms, beetles and flies, and in the winter, fruit, berries and household scraps, but they also eat carrion throughout the year and have been known to kill small mammals. They are scavengers and predators and during spring, when they are feeding their young, they raid nests of songbirds for eggs and baby birds. Recently a plotholder on the east side reported the peace and quiet of a Sunday afternoon at the allotment shattered by the desperate screams and attempts of a pair of blackbirds to keep a pair of determined magpies from raiding their nest. For more than an hour the blackbirds fought off attempts by the predators – at this time of year, they are truly pests. 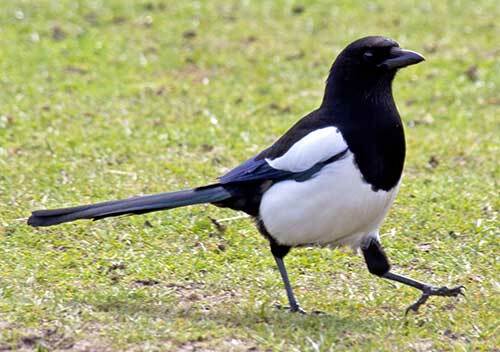 They aren’t known as “thieving magpies” for nothing. They have a reputation for loving bright, shiny objects and will swoop in to steal them. So beware - don’t leave your sparkly jewellery unattended on your plot!